I have a pretty extensive music collection on my near-full 160GB iPod Classic and sometimes I run across something that I haven’t heard in a long time and wonder why I haven’t. 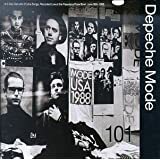 This morning I’ve been listening to Depeche Mode 101, a live concert album they did in Pasadena, CA, in 1988. It reminds me of my first job. Back in high school, when I was 14, I got a job at a local dry cleaner. I actually got notified of the opening through a long-time friend of mine and, for a time, we both worked there, though he left before I did. It didn’t start out well, at least, it didn’t in my 14-year-old mind. My first task, on my first day, was to get a bucket and brush and scrub the walls in the tiny bathroom in the back. Pretty nasty. write up the order tickets for people, play cashier, that sort of thing. I can still remember the general pricing structure - $3.80 for a shirt/blouse to be dry cleaned, $0.50 extra for silk or rayon because they needed to run in a separate load and took extra care when spot cleaning; $1 for a washed/starched/pressed men’s dress shirt. When folks weren’t coming in, I’d clean the place - sweep up the lint that accumulated on the floor, mop, wipe down the equipment - and prepare things to be cleaned the next day - separate clothes into different bins based on which load they needed to run in, undo all the buttons on the dress shirts to be washed and bundle them into bags for washing, and so on. Eventually I got to a point where I could run the washer for the shirts and the Permac dry cleaning machine. You’d get to know the customers who came in, what they usually brought in, how often, and so on. There was one lady who always came in driving this Porsche 964 Turbo with rear fender vents. We always looked forward to that - it was the coolest car we’d ever seen. She offered to take us for a ride in it, but none of us ever took her up on it. It’s amazing some of the weird skills you pick up when you work places. I can still usually tell by feel if something has silk or rayon in it, even blends (faster than checking the label when pricing things). I can unbutton all of the buttons (sleeves, collar, front) on a button-up shirt in a couple of quick movements (gotta be unbuttoned for washing and pressing). Anyway, hung on the back wall, above the giant washing machine (actual washing with water, for the men’s shirts), was this boom box with a tape deck. It was covered in the oily lint that got all over the place. The speakers were detached from the body and hung about four feet on either side of it. On the Saturdays when I was there minding the shop, I’d break out my 101 tapes and pop those into the boom box. I listened to them enough that they got demagnetized in places and the tape was sort of stretched and weird sounding in others. With Depeche Mode cranked in the background, I’d get into a work flow and take care of business. It’s weird how music can make you remember stuff. Now, every time I hear 101, it’s like I’m back at the cleaners on a hot Saturday afternoon, waiting for that Porsche to roll in. Maybe this time I’ll take that ride. Saturday evening Jenn and I went to the Oregon Zoo to catch the Tears for Fears concert. I gotta say, it was awesome. Hearing the hits played live was so cool - the crowd singing along to “Head Over Heels,” dancing to “Shout,” and getting back to the original “Mad World” was not to be missed. The weather was totally agreeable - nice and sunny, in contrast to our B-52s outing. We kicked back, relaxed, ate an elephant ear, and took in the music. If you get a chance, see these guys live. If they come back, I’m there. Jenn and I normally go work on a professional fireworks shoot each year, but this year was special - we were in charge of our own show in Sandy, OR. The show was actually sponsored by the City of Sandy and they had some donations come in to make the show larger than last year’s, so it turned out there was a lot to shoot. I think we calculated it at just under 900 individual shells and seven pre-fused boxes. Setup took five or six hours because it was pretty hot out and we took frequent breaks to rest and rehydrate. Something different about this show than we’d dealt with in previous shows was that we were burying the mortars in sand above ground, rather than having a trench to put them in or wood legs to attach to the mortar racks. Setup went smoothly, though, and we had a couple of hours to eat and rest before the actual shoot. The show proper lasted 33 minutes, which was almost 20 minutes longer than the previous year’s show. We were told we were trying for a “20+ minute show” and we thought we’d try for about 25 minutes so it wasn’t too long (people get bored) and it wasn’t too short. We didn’t know how fast it would go, so we started off taking our time… but Jenn was watching us with a stopwatch and saw that we got to the 1/4 mark and were eight minutes in, so we sped up. By the time we’d shot half the shells, we were going as fast as we could light them. Clean up went super-fast, just around an hour, and we got a bit of help of some of the community emergency response team folks in picking up garbage. 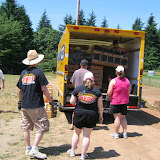 While half the team picked up trash and raked, the other half loaded the mortars back on the truck, and that was that. Smooth sailing. Our team was new to the fireworks game and they did a fantastic job. Big kudos to Ronda, Paul, Torin, K, Curt, Jessica, and Garth - you guys were awesome. Really, there were only two small snafus we ran into. First, I’m not super comfortable driving large trucks, and this was a pretty decent sized truck. I had a little bit of a mishap involving the gutter above my garage and the back of the truck due to some misjudgment in the length of the truck. No damage to the truck at all, but I’ll be getting a new gutter. Second, we had a rough time finding someone to open the gate and let us onto the field to start the setup. Sgt. Shawn Burns from Sandy Police totally came to our rescue with that and with anything else we needed all day - huge thanks to Sgt. Burns for all of the help! After all was over we got several compliments from the people working security and from some of the spectators saying this was they best show they’d seen in years. That’s really what makes it worthwhile - the cheer of the crowd and the ability to legally and safely light off some pretty amazing explosives. Definitely a good show to work. It could have been a little cooler, but only having to drive an hour or so and easy clean up? Can’t be beat.